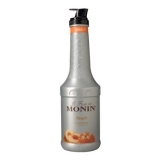 Monin Peach (Peche in French) syrup in a stylish 70cl glass bottle. Peaches are believed to be native of China where the legend said the peach was consumed by the immortals, due to the fruit's mystic virtue of conferring longevity to all who ate it. Each year, the summer season signals the arrival of juicy, sweet peaches. But infusing your recipes with the sweet, unmistakable flavour and rich golden colour of peaches does not have to end when the long days of summer fade. 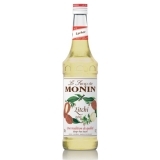 Discover how Monin Peach can enhance your beverages with fruity, delicious flavour! Taste: Long lasting white peach smell and taste. Applications: Teas, smoothies, cocktails, fruit punches, lemonades, sodas. Please note - E102, E129 may have an adverse effect on activity and attention in children. Please note: Not compatible with coffee or chocolate.